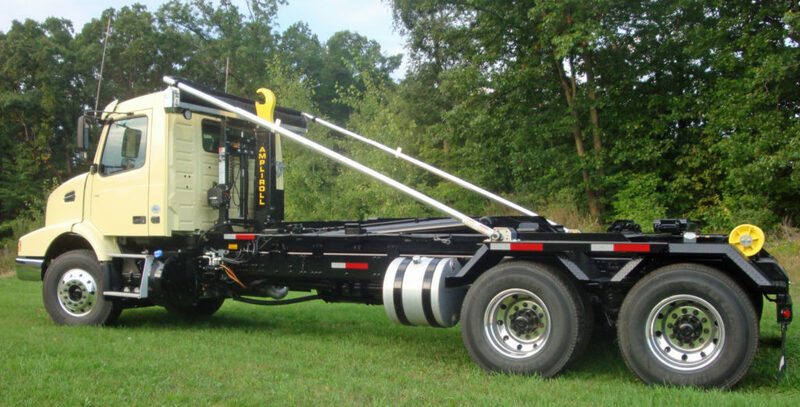 You don’t have to work long in the contracting, municipal or waste hauling industries to learn the many advantages of hydraulic hooklift-equipped truck chassis. Just like a cable-loader outfitted truck, one hooklift system chassis can do the work of many — dropping off a body here, hoisting on another there, swapping out yet a third the next day, and so on and so on. While you might purchase a number of roll-on/roll-off bodies, you can buy but one chassis, insure just one truck … and train (and pay) only one operator. Now “up” those advantages if you choose a hooklift over a cable-loader system. The big benefit? Your driver will operate all controls from the cab. They’ll appreciate the convenience of not having to climb in and out of their rig in the sweltering summer heat, in the cold, fall rain, or on a snowy (and slick) midwinter day. Meanwhile, you’ll like the greater speed the hook loader set-up allows. By shaving minutes off each pickup and drop off, it’s not uncommon for hydraulic hooklift operators to squeeze in an extra couple or three loads a day over their cable-loading competitors. Maybe even more, depending on the distances driven. Another thing about hook loaders both you and your driver will appreciate? Not treading potentially slippery ground when hooking on cables or standing outside next to moving machinery when operating the controls. Now, it’s true that cable machinery mishaps are probably rare. But then again, why take any chance at all with your driver’s health when a hooklift lets you avoid the risk altogether? A steel-enclosed truck cab helps shield them from accidents. We counted 4 dozen different bodies for hooklift hoists!